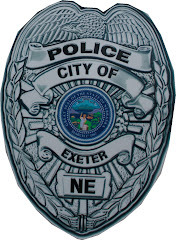 I grew up in Exeter during the 1950s, '60s, and '70s but left Exeter for college and then a life in Illinois. In July 2012, I visited Dayton, Ohio, to attend a theater festival. My partner had submitted a play script in Dayton Playhouse's annual play contest and was one of six finalists. At a reception for the playwrights, I met another contest finalist and his wife, Gretchen, who had come from Houston. While chatting with them, I mentioned that I grew up in Nebraska. Gretchen asked what part of the state I was from, and when I told her my hometown was near Lincoln, she asked the name of the town. I told her "Exeter." 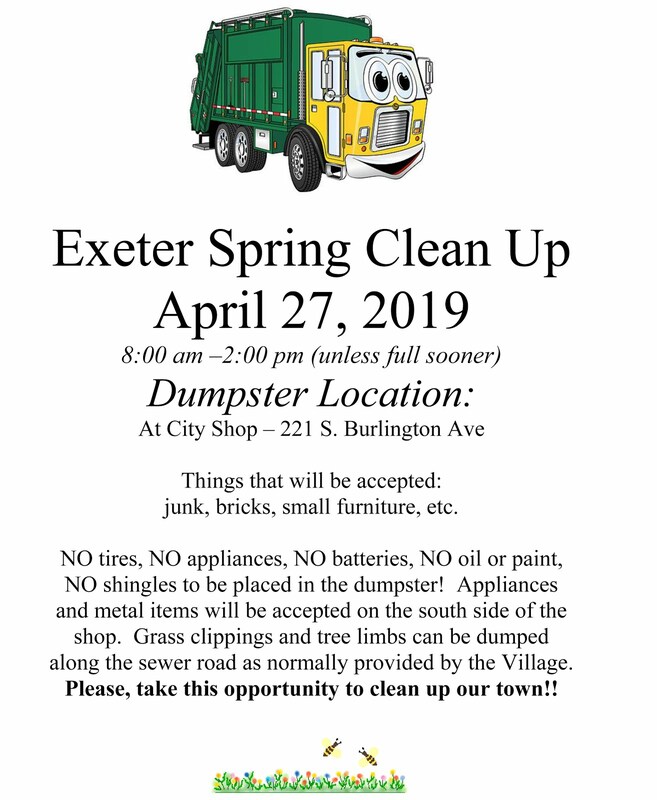 "Oh, Exeter," she said. "Some of my family were from there." I said, "What a coincidence," thinking she must be mistaken or she's kidding. I've lived outside Nebraska for more than thirty years and have only rarely met anyone who has even heard of Exeter. I didn't pursue the subject with Gretchen then, and the conversation went to other things. But later in the weekend, I met Gretchen again and asked the name of her family members from Exeter. She said the name was Larimer and that her grandfather and great aunt grew up in Exeter in the early part of the twentieth century. A little later, during the intermission of a play, I called my mother, Exeterite Bernie Larsen, who checked her copy of the EHS alumni directory. 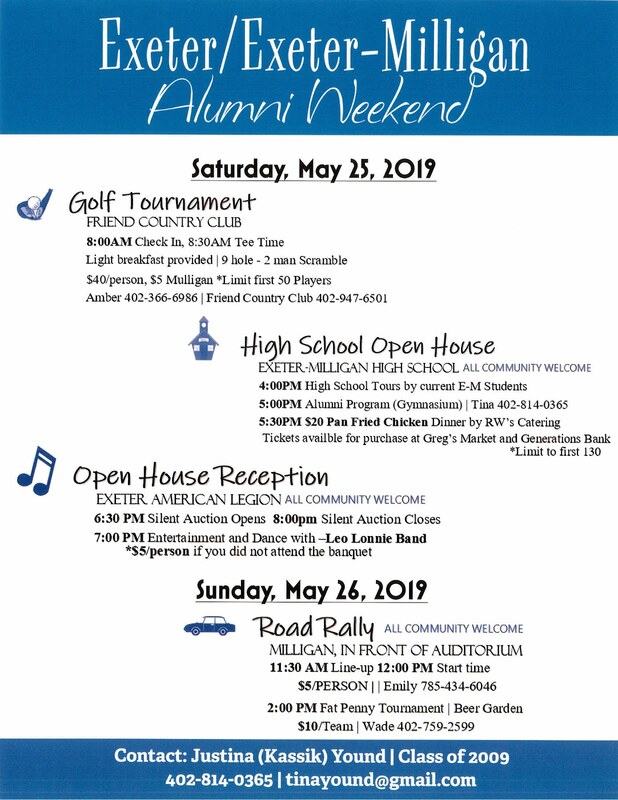 Sure enough, two Larimers graduated from the high school: Peter in 1905 and Alma in 1910. When the playwrights and their partners gathered for dinner that evening, I told Gretchen what I had discovered. She was touched, and since then we've kept in touch. 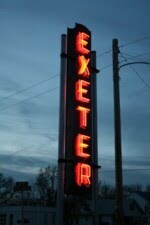 I recently sent her a postcard of the Exeter neon sign, and she emailed me, saying she had discovered the villageofexeter.com website, calling it her favorite site about Exeter. She especially enjoyed the stories about the Gentry family. And so did I. Thanks for a great way to keep in touch with all things Exeter. Thanks Wayne for sharing - glad you like the site. Thank you for sending in your great story about what a special place Exeter is.